Therese looked down at the rebel army led by Duke Nürnberg visible below from atop the field encampment and the further raised and expanded wall. Just when we accepted the remnants of the escaped Helmut royal army, and finished their rearrangement as well as equipment supply, we were able to confirm the gradual ammassing of the rebel army. Philip, who led the royal army’s group, answered my question. Being a excellent tactical commander despite blundering at the inheritance dispute, he accurately saw through the military prowess of the rebel army. Due to Philip’s remark, Erw and Ina’s group, besides me, apparently can’t hide their discomfort. While saying that, Therese brings the telescope, which hung around her neck, in front of me. My and Therese’s faces stuck together and her nice scent tickled my nose, but I tried to not pay any attention to that and observed the vanguard of the enemy army. Mobilizing me and other magicians as well as a great number of soldiers, a large-scaled field encampment was completed in the Great Sorbid Wastelands. For the sake of defending against the rebel army that’s marching north, a large and long wall, which even rivals large scaled castle walls using clay and rock, was finished. Palings against horses have been erected all over in front of the wall and countless holes have been dug out as well. No matter how much the liberation army struggles, it won’t be able to gather more soldiers than the rebel army. Accordingly, Therese opted for a strategy of chipping away the enemy army’s forces with a defence battle in the Great Sorbid Wastelands. It’s already approximately five months since the rebellion started. The Great Sorbid Wastelands has developed into a big military base of the liberation army. Therese was busily working at commanding the change into a military base, controlling the nobles and governments in the rear in preparation for a protracted war and maintaining the liberation army’s organization and its supply structure. Since I was assigned to the post of staff officer, I have been helping out with the processing of the documents together with Ina and Elise for some reason. Katharina helped in the construction of the field encampment and acted as assistant of Burkhart-san who was teaching the other magicians. Luise and Wilma were assistants for the combat training. Erw has been taking lessons in the commanding of an army under Philip. Also, he trained his katana techniques together with Haruka. Which reminds me, I wonder what has Doushi been normally doing? For some reason he worked hard at the reclamation and construction of the field encampment, and went hunting in nearby places. Takeomi-san has been devoting himself to his guard role by staying at my side. Occasionally, when he had time to spare, he looked at Erw and Haruka with looks and expressions full of anger, but neither of them minded at all. They created a world for just the two of them. There were also situations where Takeomi ended up running away while crying after being teased by Burkhart-san during his reminiscent talk. It’s probably Burkhart-san telling him to finally grow up, but I don’t think that you can cure a siscon that easily. Even after Takeomi-san ran away, I processed documents calmly. There’s Ina next to me, too. I think that it’s the end of the liberation army if an assassin is capable of appearing in Therese’s office. Burkhart-san taught magic to young magicians even though they were from the empire. Since it’s only for a short period, their mana won’t grow that much, but there was no one more superior in magic accuracy and mana efficiency than Burkhart-san. In reality, such a task probably belonged to Bladdson-san, but he had been murdered hideously. That’s why Burkhart-san took over this job resulting in the number of his pupils once again growing on the distant imperial soil. I got incorporated into the liberation army despite being a foreign noble, but it doesn’t seem to be an issue since I received the peerage of imperial, honorary Earl. Also, this was the biggest surprise (?). With Therese saying this, she apparently eliminated the meddling by the other nobles. However, I’d like her to stop agitating them too much. It’s related to the improvement of the morale, but if things don’t go well, it’s very likely that it will become a primary factor for losing if they get deceived by Duke Nürnberg’s schemes. It’s as Therese says. Thanks to that I increased my power on the surface. However, I wonder whether it’s really fine to hold two peerages without getting in contact with His Majesty? There’s no precedent and the bureaucratic nobles will likely kick up a fuss. Even so, I was grateful that Doushi is nearby. It’s because if he’s able to explain things to His Majesty later, he will likely describe the circumstances correctly. Of course we can also expect a lot from him even as war potential. Doushi stared at the rebel army with a sharp glint in his eyes. It was as if he’s daunting the entire enemy army. Conversations like these took place as well, but currently I’m watching the battle formation of the approaching rebel army next to Therese. I feel like Elise mood has unmistakably taken a nosedive, but currently it falls under war preparation. Thinking that I will cater to her mood later, I averted my look from the rebel army. It’s definitely not because Elise was scary. Therese is confident after seeing the group at the front she could confirm as nobles from their faces. That means, just as Philip said, the group at the front is a disposable unit. That’s why there will be no problems with their equipment being bad and their training being insufficient. Losses will come up and fatigue will also accumulate. We will likely waste a large amount of arrows, too. At the moment we got exhausted Duke Nürnberg would be able to attack us with his favourite elites causing the risk of the field encampment falling. Regarding the unneeded nobles and soldiers as nothing but consumable goods can be called as logical thinking at a frightening level. However, since he and his staff won’t be among those victims, he might not feel overly much mental anguish over it. At the same time of conveying Therese’s order to our entire army, the rebel army… didn’t start moving. That’s because three knights approached our side while hoisting a white flag, despite their army being in a formation ready for battle. The knights hoisting the white flag were military envoys. They called out to Therese and she answered them. Despite the opponent being a rebel army, that was etiquette. The knights didn’t ask or say anything towards Therese’s reply that dripped with sarcasm. The military envoys return to their own army’s position after proposing something unexpected to Therese. The condition presented to Therese by the military envoy was to hold a dinner between the leaders before the battle. I wonder just what the hell will be achieved by doing something like that? Is this a flag that often occurs in such kind of stories where we are supposed to think 『The enemy has their own circumstances as well, so they aren’t really hateable either, right?』 after actually trying to talk and listening to the explanation of the enemy boss? Or more precisely, something like that is unnecessary this late in the game. In my eyes I believe that I’d like someone like Duke Nürnberg to perish on his own accord if he gets defeated. Everyone including me revealed an expression full of surprise due to Doushi having a decent opinion for a change. Since Burkhart-san was next to Therese as well, he has heard the conditions regarding the dinner of military envoys. For both sides it was up to three people including the respective leaders. The location was right at the half point that can be watched by both armies. Moreover, we were told that it’s fine for our side to prepare the dishes. Even though there’s also the possibility of us putting poison into it, they still don’t mind. In this time’s rebellion play, there was also the means of us killing him with magic in the worst case. However, that method was actually prohibited by Therese. That means it will be easy to use the existence of Duke Nürnberg, who was murdered premeditatedly, for the next guy to cause a rebellion. There was the possibility that survivors, who can’t agree with the settlement, and other nobles would use him as a banner for a rebellion. There’s also the worry that the group that supported Duke Nürnberg would join up with other dissidenting elements to hinder the rule of Therese. She’s saying that he might have had the intention to advertise Therese’s cowardly behaviour to both sides. Therese sends a messenger to High Earl Mizuho who has set up his army in the centre just like her. A few minutes later High Earl Mizuho showed up and accepted Therese’s request. High Earl Mizuho ordered his retainers at once and they began to put up the tent for the dinner at the halfway point between the two armies. Furthermore, transferring even such things as magic tools for cooking, the cooks that are employed by the Mizuho household, start their work. It seems they are preparing something similar to traditional Japanese cuisine that’s brought in courses, but it looks like High Earl Mizuho’s worry is about whether Duke Nürnberg, who is famous for hating the Mizuho people, will eat the Mizuho cuisine. High Earl Mizuho showed an expression of surprise due to the personal information about Duke Nürnberg he learns of for the first time. Certainly, usually he makes one imagine that he likes his home town and that he puts the highest priority on it. The prince-electors and their successors spend long time staying in the imperial capital. His hate towards the cooking of his home might have grown all the more thanks to that. 『Something like thin flavouring is for the poor』 and 『It’s better to use plenty of seasoning』 mainly seems to be firmly rooted in the opinions of the elderly. A few hours after that, the setting up of the tent and the cooking preparations had safely come to an end. I think I’d like to eat it, but both sides can only bring two attendants. It’s unlikely that me, a foreign noble, gets chosen. Even if I had a meal with that Duke Nürnberg, I don’t think that I would be able to enjoy the taste of the dishes satisfactorily. Wilma, whose appearance of holding the prototype sniper rifle has become completely familiar, seems to look forward to a Mizuho restaurant tour. A booklet called Earl Mizuho Country’s National Restaurant Guide was tightly grasped in her hand. I wonder just when did she obtain that? Since it was a sudden proposal by the other side, Therese still hasn’t announced her attendants. However, there was no expectation for me, who is a foreign noble, to be chosen. Katharina, who is my wife, will likely not become a candidate either. Katharina apparently remembered about me previously telling her that her etiquette is too exaggerated. I guess Ina’s prediction can likely be described as mostly valid? However, it seems that Elise’s opinion was different. I end up being astonished by Erw, but since I have only once seen that Duke Nürnberg is a discerning, keen, handsome man, he’s nothing more but an enemy for me. In the end he’s only causing troubles for others. If possible, I wish that Elise’s prediction doesn’t come true. However, contrary to my hope, Elise’s prediction proved to be right. Being ordered to attend by Therese, I got stuck with going to see the face of Duke Nürnberg whom I don’t want to see at all. The option of refusing not existing is likely a remaining habit of my time as salaryman where it was wrong to not entertain the other party, no matter how much I might have hated it. Duke Nürnberg and Therese exchanged their greetings at the halfway point between the two armies. Both of them exchanged words filled with sarcasm, but both sides don’t get angry and continue speaking while smiling. I observed this give-and-take between these two, who were born to be high-ranking nobles, with the look of a petty bourgeois. Despite thinking that it’s a scene that might very well take place in a historical drama. With the recent defeat, young Duke Baden obediently returned to being a person who silently does his work as number 2 of the liberation army. It might turn into amusing joke material if he perpetrated something again, but from our point of view, who have actually suffered damage, it would be intolerable. I pray that he will continue with his current meekness. Even he himself dislikes voluntarily dealing with Duke Nürnberg. He only did a light greeting following the rules of courtesy. Given that the meeting needed preparation as well, it had become time for dinner. A table and chairs have been placed inside the tent and flower arrangements and hanging scrolls have been put up as decorations, too. It not being tatami-matted might be out of consideration for Duke Nürnberg. Chopsticks, spoons and forks have been placed at every seat. Once all of us sit down on our seats, the Mizuho people in charge of waiting upon us carry in the first dish. Zauken looks to be around 50 years old. He’s a man with a well-trained body and a characteristic scar running across his right cheek. Talrand was around 30 years old and had no special characteristics. He has a medium build and his face has no parts that would leave an impression. He’s a normal man you can find in any city. Although he has no special characteristics, conversely the lack thereof makes me feel an excessive, bottomless fear. Since Burkhart-san isn’t here, I investigate his mana, but going by my estimation, he has slightly more than the previous Katharina. I think that I’m quite capable of dealing with him, but his ability is clearly superior to that of those four brothers. What scares me above all is that there were parts in this man I couldn’t read no matter how much I observe him. Talrand bowed to me while staying expressionless. The bow doesn’t make one feel any impoliteness at all, but it’s not something that gives a good impression to the other party either. Despite being a male magician that possesses quite the mana pool, he doesn’t leave any impression with me for some reason. I only sense eeriness from him. Well I wonder what Therese feels in regards to Talrand? Currently I can’t ask her, but I’m really curious about it. Upon Therese’s signal, the young male soldiers in Mizuho uniform take over the the role of servers and the dishes are carried in. As expected, the dishes seem to be similar to traditional Japanese cuisine. On top of the table there was a menu with skillfully written characters on paper resembling Japanese paper. Appetizer: Tofu, Abalone, Sweet Coltsfoot, Bean-curd lees. Supper: Sea bream in tofu skin, cooked ink, hen-of-the-woods. Different Flavours: Black tuna, squid, flounder, prawn, blood clam. Medium-sized snacks: Common clam, mizuna, dipped garden eel, bamboo shoot with pepper stir-fry, stewed sardine, kelp with herring roe. Flame-broiled: Mackerel pickled in sweet miso, Fuki flower buds. Boiled dishes: Small turnip, fish liver and eggs in tea cloth, cabbage, taro cormel. Pickled dishes: Halfbeak, red turnip, wood jellyfish. Finishing supper: Red miso soup. Pickled vegetables: bok choy, chopped vegetables pickled in salt with red shiso leaves. Dessert: Soft sweet bean jelly, pear, powdered green tea. It properly resembles the menu of the high-class traditional Japanese cuisine I was taken along to only once during my time as trading company member. The sense of the season in the ingredients was all over the place, but that’s probably because they can be kept in a fresh state once you put them into a magic bag. That point is more advantageous than Japan. The dishes that came out in order were delicious as well. Even though I planned to focus on the food and stay silent, I’m immediately addressed by Duke Nürnberg. Since I, who’s not a Mizuho person, handles the chopsticks skillfully, he might consider that as strange. In reality I was a Japanese whose customs and culture resembled theirs quite a bit, but there’s definitely no way that I will tell him that. Though, even if I told him, it’s very unlikely for him to believe me. For some reason Duke Nürnberg frequently addresses me. Once I wonder whether he and Therese will start the negotiations of the terms for surrendering, he talks with Therese occasionally, otherwise he concentrates on the food. Young Duke Baden focuses on the dinner as well. Zauken of the other party didn’t know what to do with the dishes that were presented to him. Given that the flavour capitalizes on the ingredients, it probably feels bland to a native person of Nürnberg Dukedom. Talrand put the food into his mouth silently just like a machine. Duke Nürnberg seemed more straightforward than I expected. After all he’s at least capable of following up on his subordinate who seems to dislike the Mizuho dishes. Duke Nürnberg boldly state that he’s going to unify this continent by himself. His eloquent manner of speaking is very befitting of him. There are likely many people who are supporting him after getting charmed by this. Even without saying anything, someone with a superior appearance has an advantage. I had expected it but, due to me getting headhunted by Duke Nürnberg, I see Therese’s face warping for an instant. When Therese rebuked Duke Nürnberg’s statement, he obediently apologised. Since he’s a man who aims for the hegemony of the empire to the extent of even causing a rebellion, he seems to be bad at giving up just as Therese has said. I can’t come up with anything but this. And there was also something like 『Thanks to you, there have already been a large amount of victims, but what do you think about that?』, but I locked this away in my chest. Duke Nürnberg stated that I’m a genius. There are parts where I can agree such as magic, but since I think that I’m normal in other matters, it doesn’t actually feel like me being a genius at all. He continued to strive for victory in the emperor selection, but he missed it by one more step. He says that’s the reason why he occupied the imperial capital and went as far as causing a rebellion. Duke Nürnberg talks about his own ideas. Therese’s and Duke Nürnberg’s gazes clash. Both of these two are thinking that they are suitable as next ruler if you choose only by ability. As expected of someone that was brought along to this dinner meeting. Talrand seems to be a magician of whom Duke Nürnberg expects a lot after all. He hasn’t uttered a single word. He’s politely and quietly stuffing his mouth with the dishes. There’s no　『Delicious』 or 『Disgusting』 either. Since he’s simply eating the food in silence, I even forgot about his existence for a while. I can’t feel anything but a sense of discomfort due to his non-existent presence. It deviates from the level of simply not standing out. I wonder whether a state like that isn’t caused by some kind of magic talent. However, there was no evidence of him using magic. Around ten minutes after that, Duke Nürnberg went back after enjoying the dinner until the final powdered green tea. We leave the cleaning up of the tent to High Earl Mizuho and depart on the way back, but since we couldn’t use horses, we walked by foot. Since Therese is incessantly talking at my side, young Duke Baden, who felt uncomfortable, returns to the field encampment first by running. There are past circumstances between us, and so I didn’t help him since it’s not like we got a particularly good relationship. Duke Nürnberg stated that the start of war would be early in the morning of the next day. It’s not because he’s a particularly fair man who wishes a fair and square battle. Even in the empire, units that can carry out an organized night attack are extremely limited in number. He probably judged that it would be meaningless since it will only pointlessly increase the losses even if he sends out a night attack to pass through the fences and moats against horses that have been repeatedly set up in front of the field encampment’s wall. The unit capable of a night attack are the soldiers under the direct control of Duke Nürnberg after all. Not understanding what she’s talking about, I tilt my head to the side. She probably wants to tell me that they were childhood friends as they are close in age, too? Considering all that, they didn’t show such a behaviour in the beginning. I don’t know whether it’s the truth or not, but I gloss it over by throwing suitable responses into the conversation. No sooner than saying that, Therese links her arm with mine and puts her face on my shoulder. In addition, she does so in front of the field encampment’s main gate. Of course the soldiers atop the wall watched us with astonished expressions. While that might be true, I don’t think this is the truth here. Once I looked in the direction where I sensed blood thirst, I found Elise standing there while showing a cold expression. Elise rarely got angry over things, but most recently she’s often mad at Therese. Given that she’s expressionless today, she’s probably angry to the degree of forgetting her forced smile. Next Elise gently placed her hands on the shoulders of Wilma and Luise. Once she does, the two of them jumped off the wall that has a height exceeding five meters by making use of their marvellous physical abilities and ran up to my location. They tear off Therese and place themselves at my sides. Luise and Wilma looked together at the Japanese paper that listed today’s menu. The two calmy retort Therese’s protest. It’s because they don’t wish for Therese to cling to me. We will connect the beds of everyone and sleep normally. Certainly that in itself was something I was looking forward to. I pass through the opened main gate while listening to the quarrel of the three, but the eyes of my guard, Takeomi-san, had become tear-choked again. It looks like it’s about Haruka again. Erw, who waited with Haruka for me to come back, talked with her happily at a slightly separated place. Haruka happily replied to Erw’s invitation for a date. Of course the siscon Takeomi-san raised a beast-like cry. Naturally the soldiers present in the surroundings back off as if they had seen something scary. In my previous life I only had a younger brother and in this world I was the youngest child. I couldn’t deny the possibility of father’s illegitimate children existing somewhere, but even if they do, there’s no guarantee that there’s a younger sister among them. After that we decide to go back home with everyone and to sleep normally in preparation for tomorrow. It’s no good if I don’t show my full power tomorrow, so I make sure to not have any exhaustion left. That’s because the figure of that eerie Talrand still popped up in my mind. And then, on the next morning, the final battle between the two armies begins at last. While Burkhart-san and Katharina indulged in an idle chat, the rebel army moved in a grand manner. The next morning after the aforementioned dinner meeting, the advance guard all at once started a charge towards the field encampment. The troop headquarters of the central army has been transferred to atop the front gate. Therese elegantly gazes at the approaching advance guard of the rebel army. Of course arrows and spells come flying, but they are blocked with a 『Magic Barrier』 by Burkhart-san and Katharina who are on standby for that sake. The spells are only at the level of being fired by elementary magicians, as such both of them defended against those easily. Since there’s also Mizuho’s army in the central army led by Therese, they immediately fire their magic guns and magic tool applied ballistae. It was a weapon that still has problems in the department of cost and usage limit, but even so, it mowed down many soldiers that entered into hits firing range. At the moment the enemy soldiers were stopped by the moats and fences, as well as the arrows and bullets coming flying. The soldiers fall. The wounded are taken away to the rear whereas the casualties are abandoned just like that. The small unit that went furthest ahead had been mostly annihilated, but the next batch was immediately thrown into the ring. There are many victims, but one by one they are able to place boards across the moats and the fences are pulled down by horses. Even though the rebel army’s advance guard suffered great losses, they gradually approached the wall. Philip, who takes charge of the royal army’s group, gave Erw and me a simple explanation while the royal army to use their bows as well. As usual he has a rude tone, but if you consider his past circumstances, it cannot be helped in some ways. He is fulfilling his duty as commander and, even though it’s for a short time, he was giving Erw a proper education. Philip doesn’t seem to feel any doubt about Duke Nürnberg’s strategy at all. It’s a dry analysis that doesn’t regard the war potential as anything but numbers. It might be necessary for a commander, but I can’t go that far. In other words, that means that I’m not cut out to be a soldier. It doesn’t seem to be as simple to change the war situation with a surprise attack like in historical military stories. That’s the reason why those, who succeeded in a surprise attack, are highly evaluated in history books. In such circumstances, Philip even went north and succeeded in running away to this place. Even now his command style was a big deal. That means Minister Edgar didn’t make a mistake in his character evaluation. Christoph, who is supporting the rear of the royal army’s group, reveals in a whisper. These two were probably crushed by their retainers and the maternal relatives they have employed, and thus ended up taking a wrong turn. If they hadn’t quarreled over the succession issue, that troop dispatch wouldn’t have happened to begin with. The act of pushing Karla onto me to raise money was quite constructive and didn’t cost much money either after all. I have a problem with the sentiments in Christoph’s way of talking, but the things he says are not wrong. We have no other choice but to kill the soldiers of the rebel army. After around three hours, the enemy forces took hold of the walls. Considering it’s a unit of disposable troops, it felt like a hard fight, but the reason for that is simple. There are commanding combat units in the rear. They made sure to be able to fire a large amount of arrows at any time. While were are at it, Duke Nürnberg gathered the high-ranking magicians in the unit directly defending him. It looks like they feel threatened that spells will come flying if they run away or turn traitor. Also, it’s likely that their families had been taken hostage. For Duke Nürnberg it will be a win as long as he can damage the liberation army that has little reserve soldiers even if his advance guard gets annihilated. In addition, once they are gone, he can freely take their territories and peerages. If he assigns those to his proteges, it will increase Duke Nürnberg’s sovereignty. Doushi and Burkhart-san, who understand that, seem tho consider it to not be funny in their minds despite having a carefree banter as usual. Alongside Burkhart-san’s agreement, Doushi tossed a huge boulder at the commanding combat forces. The archers that were hit directly got crushed like bugs and died. The commander, who definitely didn’t expect the boulders to reach such a distance, tried to retreat, but he was killed by the next rock thrown by Doushi. It was only one command group that got crushed by the rock throwing, but it apparently succeeded in striking the rebel army with fear. The attack momentum of the forces at the front line also fell. Therese gracefully sits on a chair in the troop headquarters and raises the moral of our allies by urging the soldiers to fight more vigorously. The arrows and spells that came flying were all blocked by the 『Magic Barrier』 of Burkhart-san and Katharina. It’s the strategy for those two to focus on this job in order to protect Therese without fail. In exchange, the magicians employed by the Duke Philip household were deployed to all units and strengthened the offence and defence with their magic. Elise, who is lacking in means of attacking, is this time also treating the soldiers in the rear. Ina continues to hurl throwing spears. Luise also shoots rocks and stones that she had gathered around the area with a stringed slingshot. Stones are an unexpectedly effective weapon in a war. After strengthening their power with a bit of mana, she skillfully hits the faces of soldiers. If she hits the face directly, her victims were either transported to the rear with a cracked forehead or died in worst case. The two of them seem to be bored with continuing the same old attacks. Wilma continues to shoot magicians and officers with the prototype sniper rifle she was lent by High Earl Mizuho. In the end this magic gun requires a lot of skill and talent to snipe from a long distance. At present it was only Wilma who could master it. Therefore only she made use of it. She snipes one person after the other. Once she runs out of mana, she resupplies her mana with the magic gems she had prepared in advance. The silent Wilma continues to snipe at the same level as a certain ○lgo 13. It’s the magician called Talrand whom I met at yesterday’s dinner meeting. He has slightly more mana than those four brothers, but for some reason I feel something eerie from him and my intuition’s alarm bells are ringing. Once I consulted with Burkhart-san and Doushi afterwards, both of them backed my opinion. Me staying on standby is something owed to the support of those two. For a while the life and death struggle between the rebel army that tries to climb the wall and the liberation that tries to prevent that continues. The loss ratio was overwhelmingly advantageous for the liberation army which is the defending side, but gradually the victims, who are pierced by spears and shot by arrows or spells, increase. Ina went to the front and thrust down her spear at the soldiers who were climbing the walls in succession. After continuing in such manner for a while, some kind of disturbance takes place on the rebel army’s side. At last that man started to shorten the distance to me while walking just like a ghost. Talrand doesn’t care about allies or enemies on this battlefield. He’s simply walking slowly towards the front gate where we are. There was another ominous part about him. Our guards don’t fire arrows or spells at him for some reason. I release cold sweat due to his eeriness. Wilma snipes at him and Luise throws a big rock, but those get completely blocked by his 『Magic Barrier』. As expected, he was an excellent magician. With even our allies receding from him, he finally stood in front of the gate and spoke with a quiet voice. Even though it’s a quiet murmur-like voice, it clearly reached my ears even on the battlefield that was overflowing with various sounds. Since he was silent during the dinner meeting, it was the first time for me to hear Talrand’s voice, but I can’t feel anything special from it after all. Because he’s simply talking dispassionately, I end up feel the eeriness all the more. Even that Doushi appears to feel some indescribably eeriness. He’s probably thinking that the battle between me and Talrand is unavoidable. I descend the wall with a ladder and square off against Talrand who stood before the front gate. The rebel army had already deserted the front gate. With Talrand being a big wig and as even the rebel army seems to be weirded off by him, no one approached us. “It’s a kind of ominous view, isn’t it? Only around the front gate both armies had stopped battling and were watching our duel. Since the struggle for life and death is still continuing as before at other places, that difference was uncanny in any way. If you ask why it turned into such a situation, it’s probably because of the eeriness released by the man called Talrand. There’s no other adequate explanation for it. Doushi descended the ladder together with me and got ready to deal with any disturbance by the rebel army’s side behind me. Once I start to prepare deploying my magic, Talrand suddenly begins to talk with a voice that has no intonation or character. Despite him having a simple monologue without talking to anyone in specific, it’s eerie. I unintentionally end up hesitating to attack. I ended up setting up my 『Magic Barrier』 in a hurry while wondering whether some kind of special magic will come flying at me. Talrand holds up both his hands towards the sky and immediately following that, a thunderbolt descend from the sky and directly hits Talrand’s body. I reflexively end up closing my eyes, but when I opened my eyes, the figure of Talrand had vanished from that place. In exchange, there is a person standing there who really resembles an acquaintance of mine. His body is covered by an armour of muscles across his large build. He wears a violet robe and knuckles are equipped on both his hands. And, with the special traits of having a handlebar mustache and a hairstyle resembling a calyx of a pineapple, a person that was exactly like Doushi stood stock still there. I check behind me on impulse, but since Doushi stood there just as before, it’s someone else. Even his voice resembles Doushi’s voice quite well. The only difference is that he doesn’t hold a wand but has equipped knuckles on both his hands. It was the first time for me to hear that shocking truth. If he wore the same clothes, I wouldn’t be able to tell them apart at all. Even so, I have to defeat him somehow. Since the battle has already started, I will start with releasing several fireballs as feint. However, the founding Earl Armstrong repels those with his fists by cladding them with a 『Magic Barrier』 and closes the distance in one go. As he stood in front of me in the blinking of an eye, I received his powerful blow. I defend against it by holding both hand in front of me and cladding them with multiple layers of 『Magic Barrier』 at once, but immediately following that, I felt a sharp pain on the back of my hand. The founding Earl Armstrong seems to be the type that specialises on magic close combat even more than Doushi. After that I continuously receive a series of kicks and thrusts loaded with mana and each time the damage to my body accumulates. With a rib apparently getting cracked due to a blow that was delivered into my abdomen, a sharp pain travelled through my stomach. It looks like the bones at the back of my hand were fissured during the first attack. While healing both parts with healing magic, I consider my plans from now on. The founding Earl Armstrong’s attacks continue in a barrage. At first I received everything, but after a short while I got apparently used to his attack patterns. Now that it has come to this, it seems to have been correct to receive Doushi’s unreasonable training during my time in the royal capital. For the sake of saving mana, I concentrate my 『Magic Barrier』, which I had spread above my entire body until then, on my arms changing it into a shield. I dodge the founding Earl Armstrong’s attacks by freely using those as slanted armour. Ignoring the mutter of Doushi who is behind me, I continue to parry the enemy’s attacks. Since my eyes had already gotten used to them, I next attempted to launch a counterattack right after parrying an attack. Dodging the the punch, I deliver a blow filled with mana into his defenseless abdomen. Due to the blow that concentrated the mana on one single point, the founding Earl Armstrong coughed up blood from his mouth. It seems like I was able to damage his internal organs. Next a kick from an overhead position approaches me, but after dodging this as well, I charge one leg with mana and make him trip up. The founding Earl Armstrong ends up falling after having his balance disturbed. I tried charging my foot with mana and nail it into his face, but this was barely avoided by him. 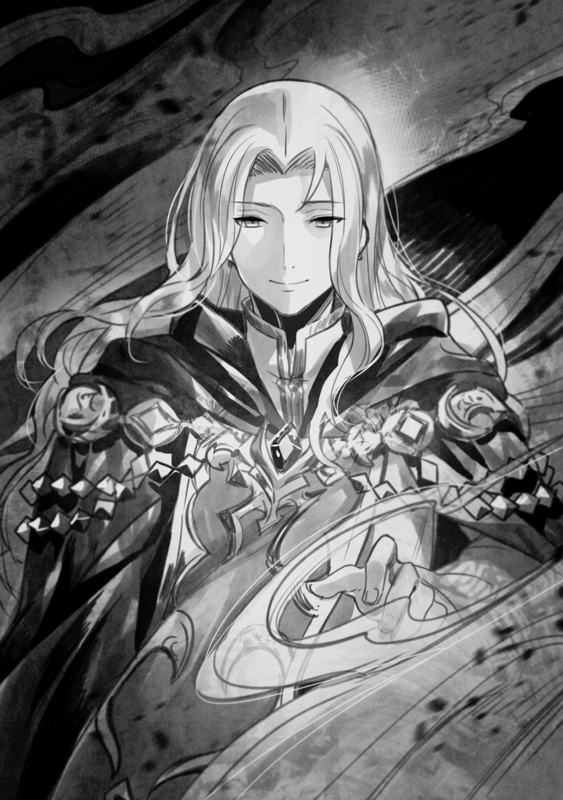 I can’t clearly declare it since I don’t understand the special magic called 『Hero Summoning』 well, but I feel like this founding Earl Armstrong is weaker than the person himself. His power and technique might be the same, but I feel like those don’t measure up to the ability of the ones who mastered those. Or, maybe his body isn’t completely in synchronization? Talrand, who had the appearance of the founding Earl Armstrong, swiftly heals his wounds with healing magic and one again points both his hands towards the sky. Once again a thunderbolt descends and once it vanishes, Talrand had transformed into another person. When a new figure showed up from Talrand after the thunderbolt was dispelled, my time stopped. It’s because my heart was fiercely shaken by the person into whom he transformed. That person who taught me magic during my childhood, ten years ago. The same figure as the late Alfred Reinford, my master, stood in front of me. Due to his pupil suddenly appearing, Burkhart-san bent himself over the wall and shouted. Even Doushi apparently can’t hide his surprise due to the appearance of his close friend. And, even I stood stock still on the spot. The figure, appearance and voice were completely the same with master. Moreover, Talrand delivers a new shock to me next. That advice was something that master told me at the time when I trained with him. I have been told the same thing by Burkhart-san as well, but being told the same words in the same manner up to this extent, I had no other choice but to accept that the person in front of me is my master for real. I ended up being tossed into a battle with master with whom I reunited by force.